Kingdom Hearts HD 1.5 ReMix Giveaway! Season's greetings, everyone! To get into the festive holiday spirit, we'd like to give something back for continuing to support us and making this such a wonderful community to be a part of! 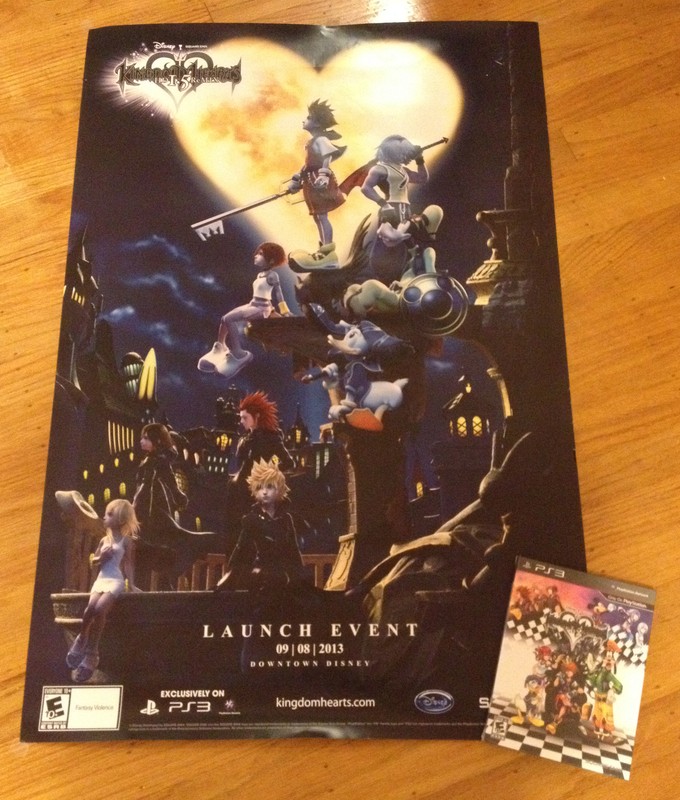 Every day from December 11th-25th, we'll be giving away one exclusive Kingdom Hearts HD 1.5 ReMix poster from the North American Launch Event! Not only that, but on the final day the winner will also receive a copy of Kingdom Hearts HD 1.5 ReMix - North American Limited Edition to go alongside their lovely new poster. That will be 15 posters and 1 copy of the game in total, to be distributed between our forums, Twitter and Facebook page. Those seeking to enter must be a member, be following us, and/or have liked our page. Registration for the forums is free and you can enter once through each of the three networks. The rules are simple: For those of you on the forums, just reply to this topic telling us what you're looking forward to in the second remaster, Kingdom Hearts HD 2.5 ReMix! On Twitter and Facebook, an image of the poster will be posted for you to reply to to fulfill the same purpose. At 3:00 PM PST each day, we'll choose and announce a random winner from the replies on the corresponding network of the day. From then, you'll have exactly 3 days to send us a mailing address otherwise you'll forfeit your prize and a new winner will be drawn in replacement. When your name has been chosen, you will automatically be removed from the list of eligible individuals for the rest of the giveaway. To all winners, please respect that these gifts should not be sold for monetary gain upon receiving. This giveaway is limited to North America only. However, if you have a proxy that resides within NA, we will be more than happy to ship your parcel to them. We will have more giveaways and contests coming soon so be sure to stick around! Good luck to you all! In the meantime, why don't you check out our annual holiday contest for a chance to win a forum award? Good luck to everyone who enters! These posters are amazing!!! Please ignore the terribad iPhone pic. What I am looking forward to see in 2.5 is the refined battle quotes of the Castle Oblivion crew in their Absent Silhouette and Replica Data battles. It would be sweet to hear Vexen, Lexaeus, Zexion, Marluxia, and Larxene utter actual words (which I think were very fitting with their personalities in Re:CoM) and sentences in contrast to just laughter and grunts! The number 1 thing I'm looking forward to in KH2.5 is the added battles agaisnt the organization members and the lingering sentiment from KH2FM, and Eraqus and Xehanorts armors from BBSFM. The new boss fights are the only things I haven't been able to do in a major kingdom hearts game due to the fact that they were japan only. what you're looking forward to in the second remaster, Kingdom Hearts HD 2.5 ReMix! Online! Online play for Mirage Arena. That would be the best possible thing. Never got to play any of the Final Mixes, so I'm am soooo gonna play that Cavern of Remembrance all day long. I'm looking forward to all the nice Final Mix content I've missed out on over the years. And the Re:coded movie, which will hopefully be more carefully crafted than Days. Definitely most looking forward to BbS. I never got the chance to play it, I keep hearing people calling it the best in the series, and I've been praying for 2.5 to be released so I'd get the chance. The Final Mix content in KHII is a huge bonus, too, it was my first Kingdom Hearts and I can't wait to see it in HD. I'm looking forward to 2.5 for so many reasons. The first of course is playing the final mixes for the first time, and seeing kh2 in HD and hopefully listening to the orchestrated soundtracks. The main reason, though, is that Birth by Sleep is my favorite game in the series. I can't tell you how excited I am to play it on my television, but also share it with my friends who've never played it before. Since my psp broke when I moved back from college I haven't been able to do any of that. Also, I think RE:Coded is really under-appreciated, and I'm hoping the cinematic version will gain some new fans. It was really cute, you guys. I can't wait to play Final Mix + and actually be able to play BBS for the first time, but on console! Definitely looking forward to the data battles/HD BBS. BBS might be my favorite game of the series. Also, I'll probably blow a load if they rerecord the music for BBS. Definitely has my favorite rendition of Dearly Beloved out of every game. I'm looking forward to the Final Mix content for KHII and BBS. Okay time to have a bit of fun and join in on this contest. I'm looking forward to the chance to play the final mixes, and I'm also curious to see how Square's going to do BBS and Coded for the PS3. i look forward to the 2.5 ReMix because we'll be able to play the final mix version of kingdom hearts II, and i look forward to seeing what the transition between handheld to console will be like for bbs, and and i most definitely look forward to wonderful HD! What am I looking forward to most in KH2.5? Why, thank you for asking, I needed a place to hype about this. FROM THE TOP, Kingdom Hearts II. Amazing game, and one I unfortunately have not had the time to sit down and replay since my original playthrough. So, going through that again in general will be a GREAT part. And then, of course, all the new content I've never gotten to touch? Data Battles with Organization XIII members? The Lingering Sentiment? The Crowns? Yes please. I couldn't possibly ask for any more! Oh, but wait, there IS more whether I want it or not. For Birth by Sleep makes it well awaited arrived on a home console! Still probably the BEST entry into the KH Series (though, 3D is a very close contender), BbS was a game I poured literal weeks into. And now, on PS3, I can play the multiplayer modes with actual multiplayer? Hellllll yeah. Speaking of, how about all those extra battles? Just like KHII, MORE CONTENT to play with. And then, hm, what could follow up my lovely night of relaxing on the couch with a bowl of popcorn watching the adaption of 358/2 Days? Oh, I see they've included the Mobile/DS underrated title Coded in a movie format! While obviously not as hard-hitting as Days, Coded was still a fun little adventure, and it will be interesting to see how it converts to a watch-only mode. If it goes well, cool, if not, I still get to eat popcorn. Oh, and ALL of these are in stunning High Definition? Man, Square, you couldn't fit anymore stuff in here even if you tried. And I'm glad you can't because I still haven't finished 1.5 and this is going to be an entire other adventure. So, er, yeah, that's what I'm excited for. Posters are awesome! Totally lookin' forward to 2.5 because all the new features in 2 Final Mix (like Limit Form and the Cavern of Remembrance) are amazing. Wait didn't I write an editorial about what I was looking forward to in that? In the remaster, I am looking forward to the new bosses that I couldn't get to in the original kh2. I am always ready for challenges when it comes to kingdom hearts.